Right now, Atlanta is in first place in the NL East, holding a seven-game lead over the Washington Nationals. They also are the only team in their division with a positive run differential. (Only the Cardinals (+106), Tigers (+76), Red Sox (+75), and Reds (+63) can best the Braves +57 mark.) That’s all the more impressive considering purported slugger B.J. Upton has been rolling with the worst batting average in all of baseball. Less confusing, perhaps, but far more amazing is the story of another recent Atlanta acquisition, one who has a great claim to be a rookie of the year candidate. Evan Gattis’ story may be rapidly transitioning into The Legend of Evan Gattis– the Braves’ radio crew probably is right when they say Gattis could tell the media almost anything and have them believe it at this point– as the season goes on and he continues to perform at a high level, but it’s worth returning to this USA Today article from April for one of the first major tellings of Gattis’ improbable tale. One undeniable thing about el Oso Blanco: he has bear strength. The rain held off for this night game, lending us– a group including ALDLAND contributors commodawg, physguy, and AD– a comfortably cool environment at our seats, high above the first-base line in right field. 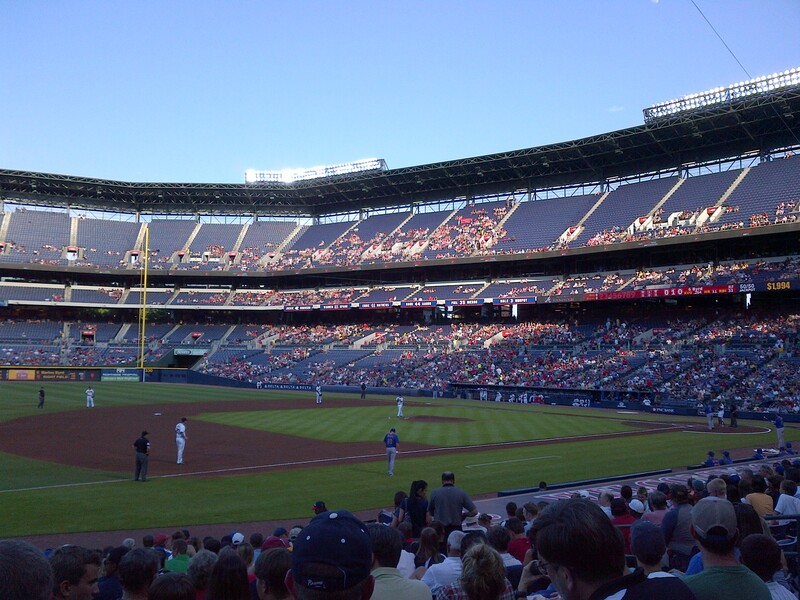 As in seemingly every home Braves game I attend, Atlanta was down early. 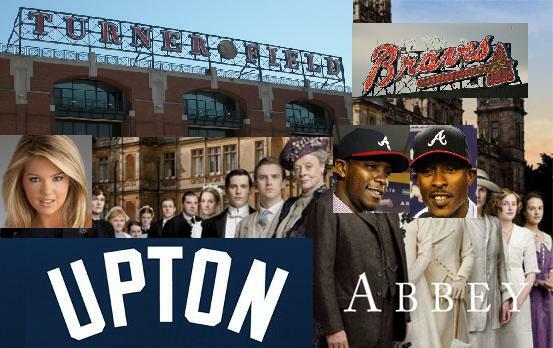 They were in a seemingly insurmountable 1-0 hole until the eighth inning, when Justin Upton held the briefest of hitting seminars with Gattis and Andrelton Simmons, both of whom immediately hit home runs. Atlanta won 3-1. Physguy and I returned to Ted’s Montana Grill & Baseball Field for the third game of this series with the Dodgers. This was the first time I’d ever gone to back-to-back games, and it was the first time I recall sitting in the outfield seats, which provided a nice view of the action and shelter from the rain, which delayed the start of the action. There was action, though, and, after falling behind early, as seems typical, the Braves won on another eighth-inning rally sparked by a Gerald Laird RBI single. The difference in this game was that Atlanta manufactured all of its runs; this was the first time I’d seen them play that they didn’t hit a home run. Still, come-from-behind wins always are exciting, and this team has the bats to make them a possibility every time out. 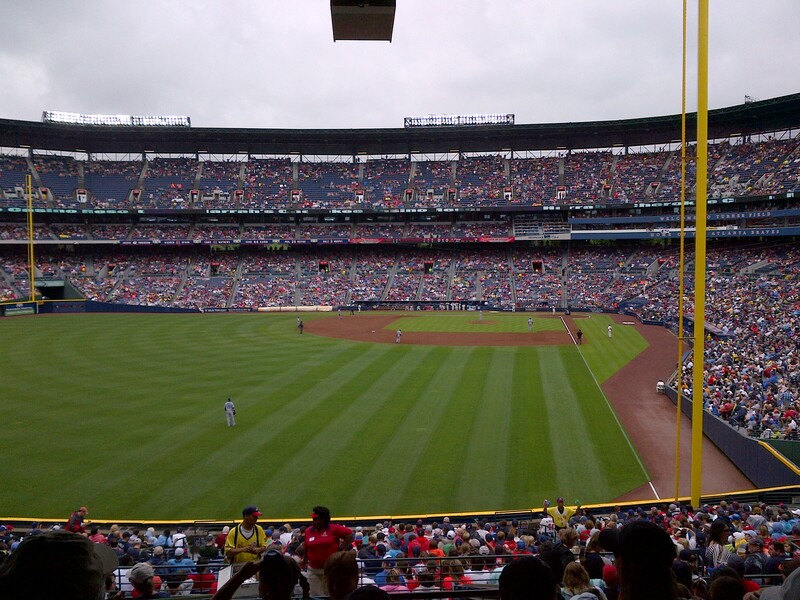 This entry was posted in ALDLAND and tagged andrelton simmons, atlanta, b.j. upton, braves, chris johnson, dodgers, espn, evan gattis, gerald laird, kris medlen, los angeles, mets, mlb, new york, turner field, usa today by AD. Bookmark the permalink.